The age of the Talmud is brought to life in a breathtaking saga.First published in 1939, this masterpiece of modern fictiontells the tale of renegade Talmudic sage Elisha ben Abuyah sstruggle to reconcile his faith with the allure of Hellenisticculture. Set in Roman Palestine, As a Driven Leaf drawsreaders into the dramatic era of Rabbinic Judaism. Watch thegreat Talmudic sages at work in the Sanhedrin, eavesdrop ontheir arguments about theology and Torah, and agonize withthem as they contemplate rebellion against an oppressiveRoman rule.Steinberg s classic novel also transcends its historical settingwith its depiction of a timeless, perennial feature of theJewish experience: the inevitable conflict between the call oftradition and the glamour of the surrounding culture. 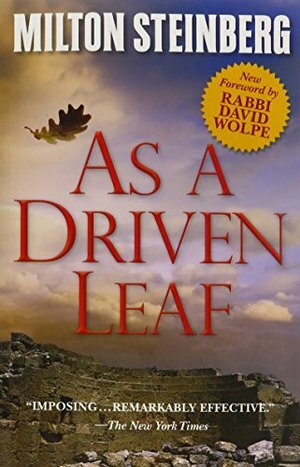 Beyondits literary achievement, As a Driven Leaf is regarded as amajor influence on contemporary Jewish life and thought.This new edition includes two forewords: One new, by therenowned American Rabbi, Rabbi David J. Wolpe, the secondfrom author Chaim Potok, originally written in 1996.